It's time for another challenge over at Frilly and Funkie. The lovely and talented Sue is our hostess and she has chosen the theme "LET'S MAKE IT A TRIO". She would like you to create a vintage or shabby chic project including 3 of something and it needs to be a main focal point of your project. One lucky winner will receive a $25 gift certificate to Linda's shop The Funkie Junkie Boutique! I used three square layers, three stencils, three tags and three flowers. 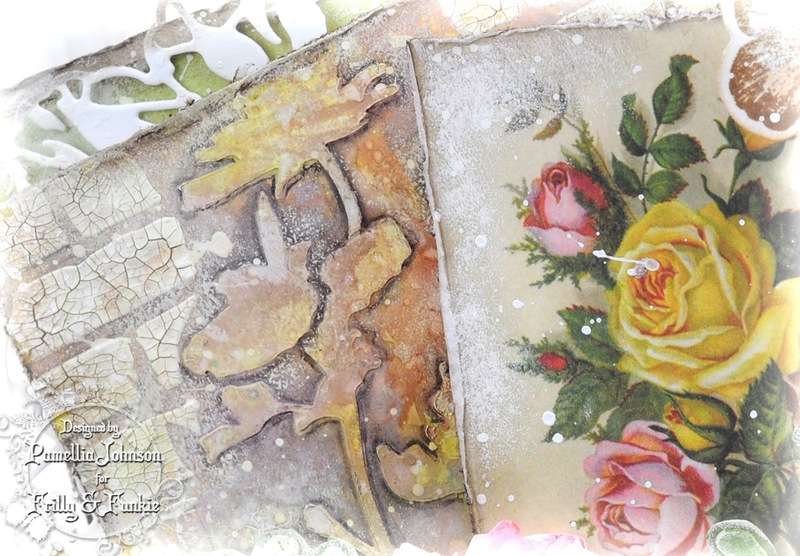 For the background, I used Tim Holtz Wildflower stencil and Wendy Vecchi Basically Bricks stencil using some plain texture paste and crackle texture paste. I then sprayed a bunch of different Distress ink sprays until I got the look that I wanted. I traced around the Wildflowers with the Ground Espresso marker and then blended it with a water brush. I also sprayed the tags with an assortment of colours as well. The doily die is from Prima, the tags were cut using Tim Holtz Tiny Tabs and Tag, the butterfly is from the French Flight set, the pearls are from Kaisercraft, the floral image is from the Thrift Shop Ephemera pack. The flowers were cut with the Tattered Florals die and coloured with Picked Raspberry. The leaves are my third stencil, the 3 Flourishes from Wendy Vecchi. I fussy cut them out and coloured them with Peeled Paint and Shabby Shutters. The sentiment is from Graphic 45 Time to Flourish. 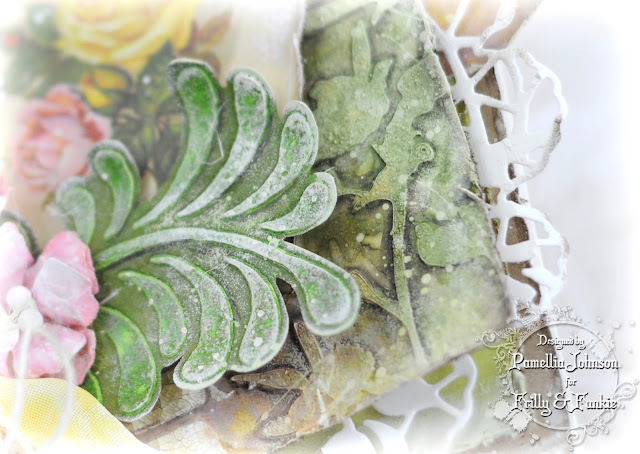 The lace is from Petaloo, the seam binding, twine and stamens are all from Linda's shop. You've done it again Pamellia and created a little gem of artwork. A project from heaven! Awesome sauce! This is wonderful with the beautiful shades of Spring and 3 of everything lol. You are so inventive. Beautiful layers and textures, another fabulous piece of art work. Charming and romantic card. Wow so many groups of three all beautifully designed together into one lovely card! Fabulous inspiration! Wow! Your card is so gorgeous, Pamelia! 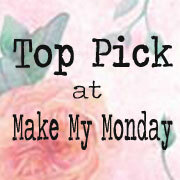 It is a big pleasure to have your blog in my favorite!!! Once again a fabulous creation Pamellia, your attention to detail is second to none and your beautiful work is a joy to look at! This is pure poetry on paper! The buttery yellows and soft creams are so inviting! The amazing background texture strikes a perfect chord. Such delightful spattering and layering and embellishing! Ooh la la! Wow! So many wonderful details on this beautiful card! Loving your crackle paste brick background...wow! Love the little bits of your colored tags sticking out :) Each and every detail is sheer perfection! This is breathtaking! Love that brick BG and the layers are stunning! 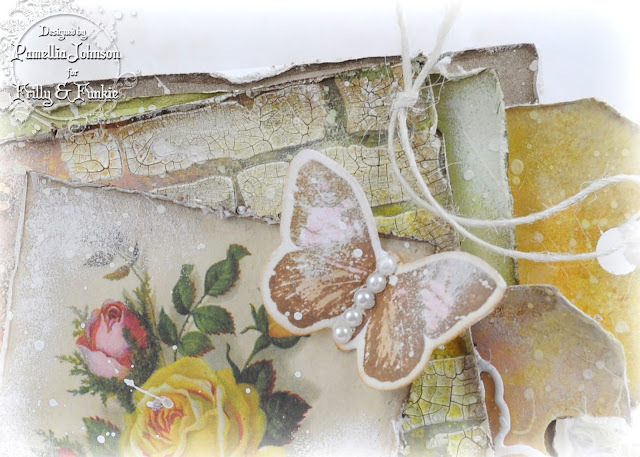 Oh my goodness Pamellia this is beautiful...soft and shabby...the colours and layers are fabulous and the detailing...WOW!! Scrolling back and forth here taking it all in!! Simply STUNNING my crafty friend!! Enjoy this beautiful day!!! Loved that stenciled and textured layer ..it totally hooked my interest ! 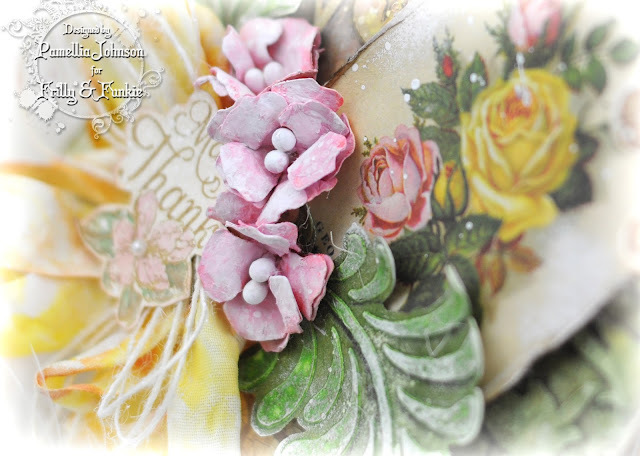 Another gorgeous creation love the soft pink and yellow flowers plkus all the layers and texture . you are the queen of flower making for sure . Pamela, this is just stunning... WOW!!! Love all the layers... goodness! This is one of your very Best, my friend! A beautiful card! love the 3 roses and all the splatter! So beautiful Pamellia, a stunning design with lots of wonderful details. Beautiful spring colours and fabulous dimension, your designs never cease to amaze me. Stunning card Pamellia! 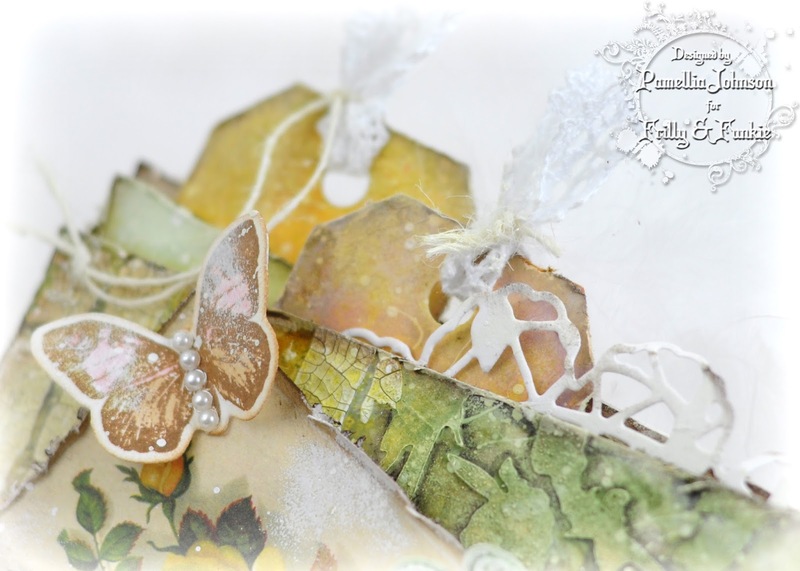 I love all of the different stencils you've used and your beautiful colors! Gorgeous card, an inspirational project Pamellia. Triple trios of tremendousness. Beautiful attention to the smallest detail as usual matey. 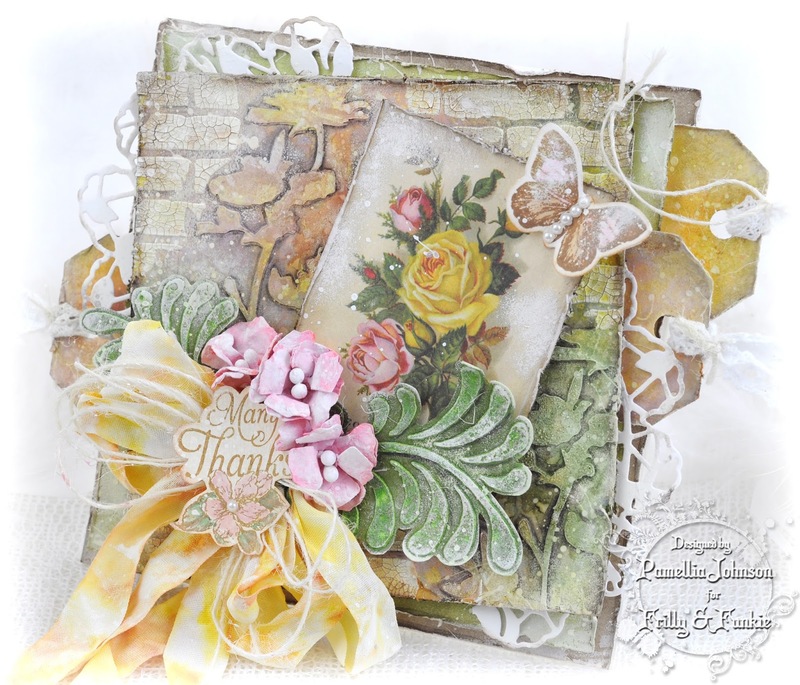 Gorgeous card Pamellia, beautiful colours and layers, loving all the textures and details. Beautiful square card with the most amazing background! I love how you've tucked in those tags and outlined your flower stenciling with the marker--a perfect finishing touch! All just lovely to look at, as always! You are so talented and such an inspiration to so many! Big hugs! Gorgeous! Love every detail you've included. So glad you shared with us at Pile It On! This sings Spring to me, Pamellia! 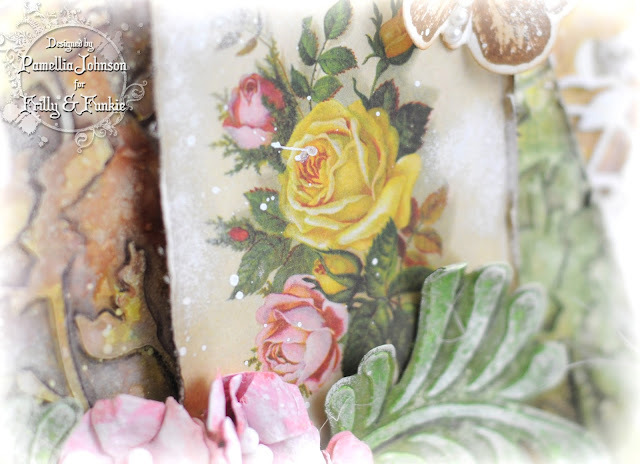 I love the colors you have chosen, the gorgeous vintage rose image, and as always, I am inspired by the beauty you create! I'm loving your gorgeous card with all of it's soft, shabby elements and texture, Pamellia! AND you did your trio times FOUR, you overachiever-lol! This is a feast for the eyes! 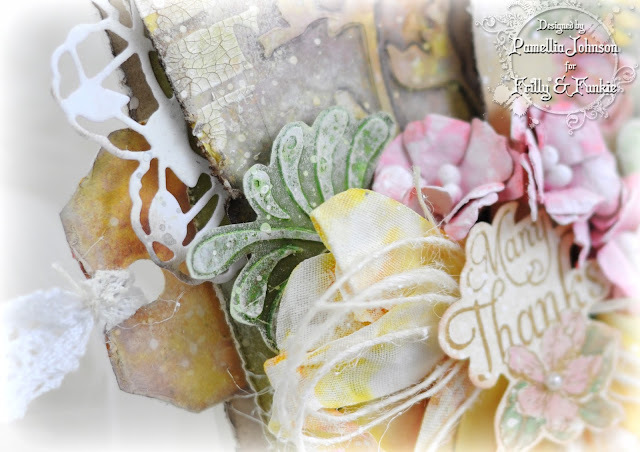 Such a fabulous theme this and you have created some stunning 3s here with all the gorgeous layers! Oh sweet Pamellia ... your creations ALWAYS inspire me! What a beauty you have created today! Fabulous eye candy for sure! WOW!!! 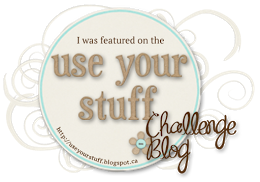 Thanks so much for joining in the fun at the USE YOUR STUFF Challenge Blog! We hope to see you again next week! Gorgeous card again, Pamellia. Really love it. another of your superb creations. Wonderful designing as usual, and super colours also. Your flowers as always are super. Gorgeous Gorgeous Gorgeous and each piece beautifully done. I can't tell you how much I love this card! So much layer and texture it makes me giddy! Stunning! Thanks for joining our ribbon/twine/lace challenge at Use Your Stuff and hope to see you again. Wow! What a gorgeous card! 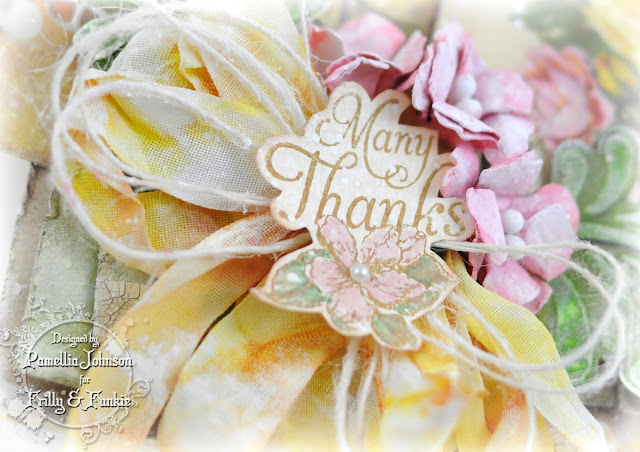 Thanks so much for joining us at Use Your Stuff Challenge Blog. Hope you join us again soon! Thanks for joining us at Use Your Stuff. I hope you will join us again next week! Cool idea using a texture-pasted stencil as a die cut! I really love that gorgeous bow too. This is a very beautiful card, lots of colour and fabulous flowers but the effect you have created on the brick wall is stunning, it is so realistic - it reminds me of an old glazed wall on a frosty morning. I love watching your videos and I can just imagine you putting this card together - it is like my own little personalized video! This s card is gorgeous! I love all of your layers, and those pretty flowers, at the ribbon and string...I just love it all! Thanks so much for sharing with us this week at Use Your Stuff! Gorgeous! Love the white added over these darker colors! So very pretty Pamellia! Love the collage of fab things! The brick wall and blossoms look spectacular! So very beautiful. I am loving this wonderful work of art. Great colors and embellies. Gorgeous, loving all the beautiful layers and texture. An amazing card Pamellia. I love the softness of the flowers against the brickwork stencil, fabulous textures, attention to detail and a stunning colour combination. Sally.x. I think I might just say "wow" and leave it at that - simply marvellous! Beautiful project, your use of the brick and flourish stencils have put them on top of my wish list.